These positive results were very similar to the 7-13-year-old study group. 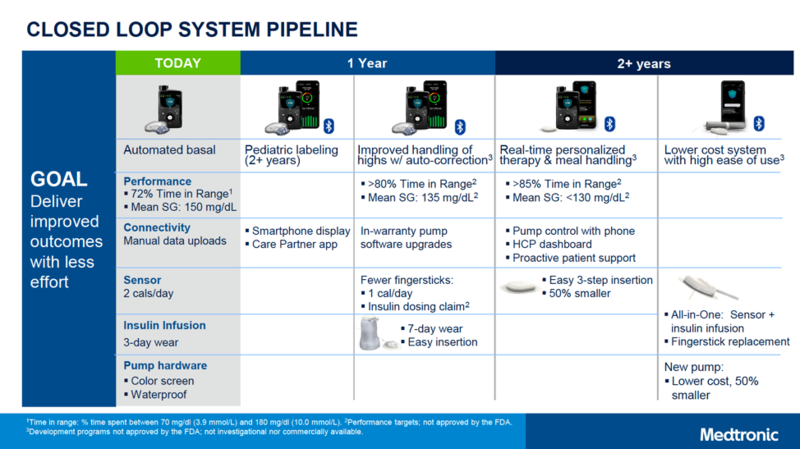 The MiniMed 670G automated insulin delivery system (“hybrid closed loop”) is currently approved in the US, Europe, and Canada for people with type 1 diabetes ages seven years and older. Medtronic announced that 2-6 year-old approval for the 670G will launch within “1 year” (i.e., by early 2020), adding Bluetooth connectivity to display data on a smartphone app. A caregiver app will also be available for remote monitoring, offering peace of mind for parents. MiniMed 780G: This second-gen automated insulin delivery system will add automatic correction boluses for high blood sugars, in addition to the current basal-rate-only adjustment in the MiniMed 670G. This is expected to enable a higher time-in-range of over 80%, with a lower average glucose of 135 mg/dl. (For context, the MiniMed 670G achieves a time-in-range of around 72% and an average glucose of 150 mg/dl.) 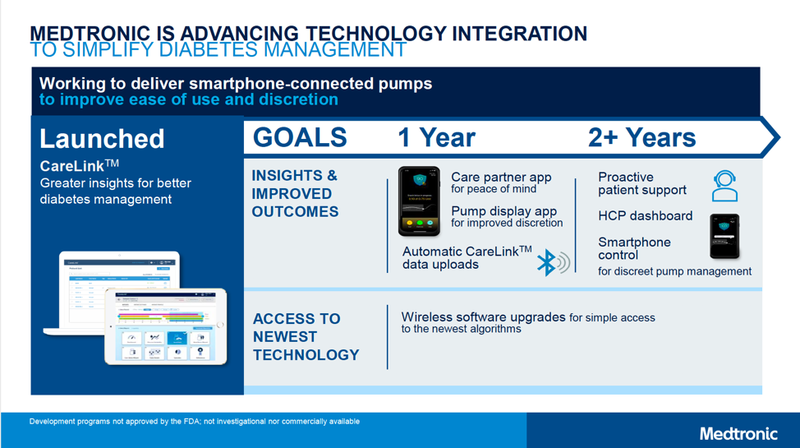 Matching Tandem’s t:slim X2, the 780G will also allow users to update their pump software from home, meaning access to the latest algorithm updates without needing a new pump. 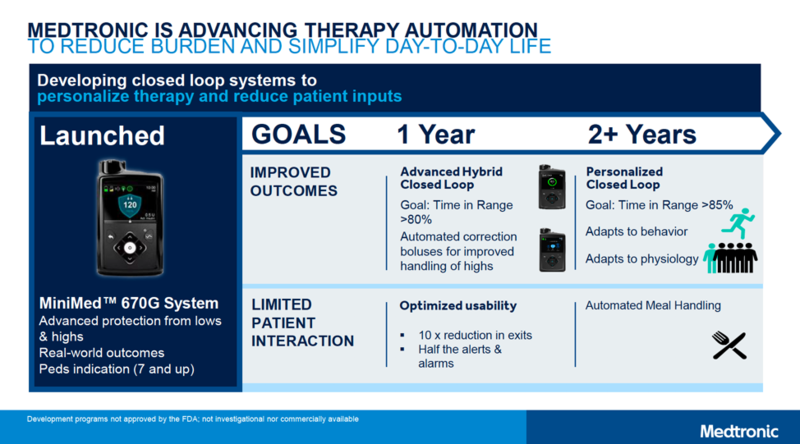 Finally, Medtronic plans to dramatically reduce Auto Mode exits (by 10x!) and cut the number of alarms in half. Overall, the 780G looks to be an incredibly user-friendly device – enabling even more time-in-range with less burden. Mio Advance infusion set in the US? The one button, automatic application, fully hidden needle inserter has been available in Europe for over a year – we hope to see a launch in the US sometime soon, as the device has been FDA cleared for 11 months. This infusion set inserter has received outstanding reviews, including from our own team – Adam has tried a couple and finds it dramatically less painful and simpler than inserting current sets. Read more about it here. 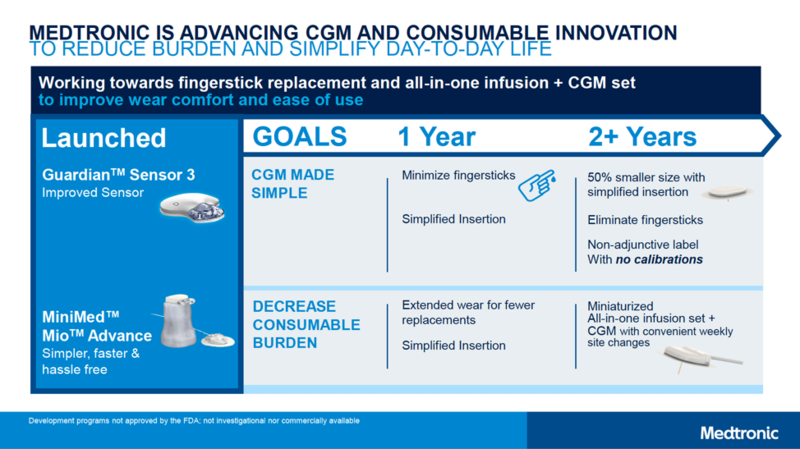 The first-generation MiniMed 670G has over 150,000 users, and we’re glad to see Medtronic’s continued focus on improving the user experience and time-in-range outcomes. 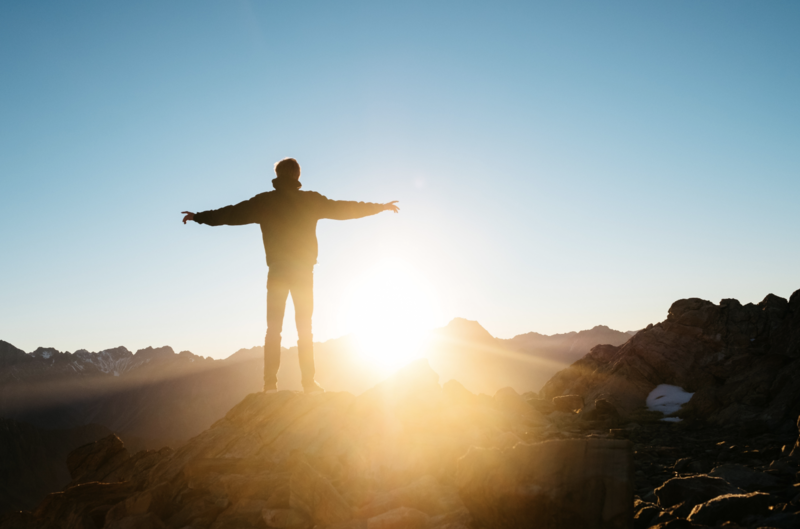 The field is moving more toward “time-in-range,” for those using CGM – learn more about time-in-range here! And stay tuned for more on new diabetes technology!